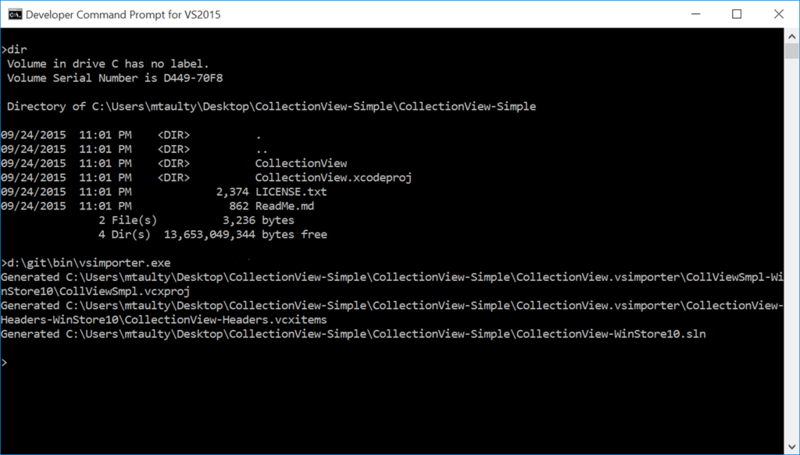 and then I build out 3 DLLs for x86, x64 and ARM using the standard compilation settings and then dump their contents using dumpbin /exports then I see. The difference is that for the x64 and ARM builds it seems like the name of the exported function is MyFunction without any name decoration whereas for the x86 build it seems like the name of the exported function is _MyFunction@0. 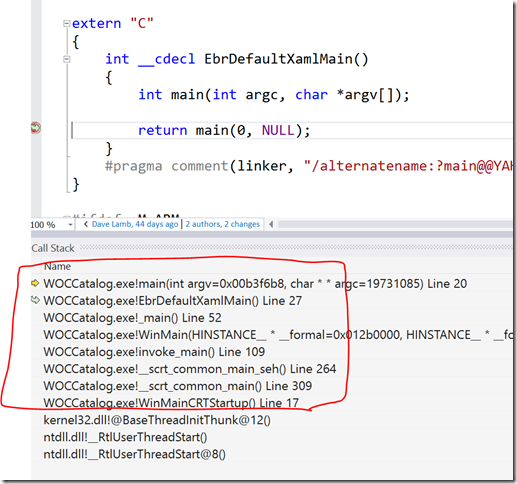 The challenge there is that if you are trying to call this function via a PInvoke then it feels like it makes it slightly tricky because the signature is different across x86, x64 and ARM. 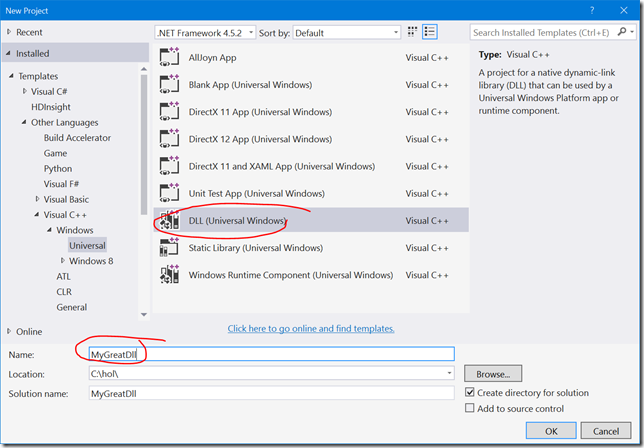 to it and then that seems to give a consistent function name exported from the DLL in all 3 platform cases. 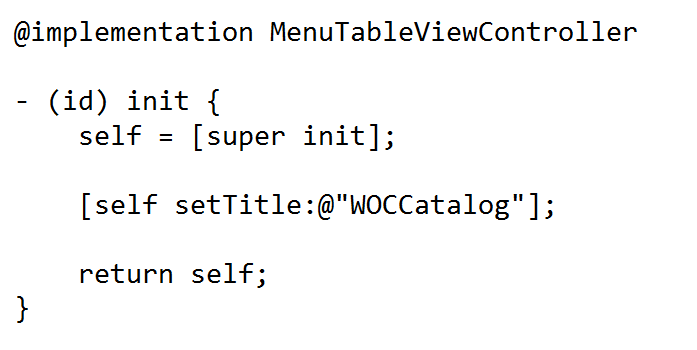 At the time of writing, I’m not sure whether this is expected behaviour or not and so I’ll update the post if I find out the rationale behind it but, in the meantime, I thought I’d flag it here as something I came across while looking at a customer’s code. I need to start out by saying that I’m not an iOS developer. I don’t think I’ve even written ‘Hello World’. I also should say that I’m definitely not an Objective-C developer. I’ve never been there although I have spent a lot of years with C-like languages from C, through C++ and on into a bit of Java and then C# but, to date, I’ve not really had the pleasure of writing anything in Objective-C. 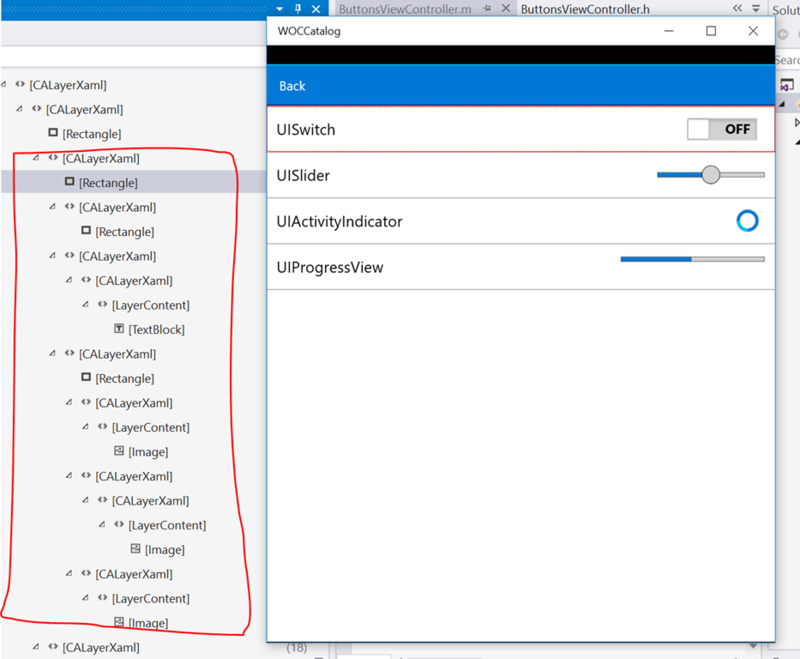 So, I’m not at all qualified to write anything much about developing for iOS but, regardless, I was still interested to take a look at the preview of the “Windows Bridge for iOS” project that’s set up to take Objective-C code (and other assets) and build a Universal Windows Platform app from it. 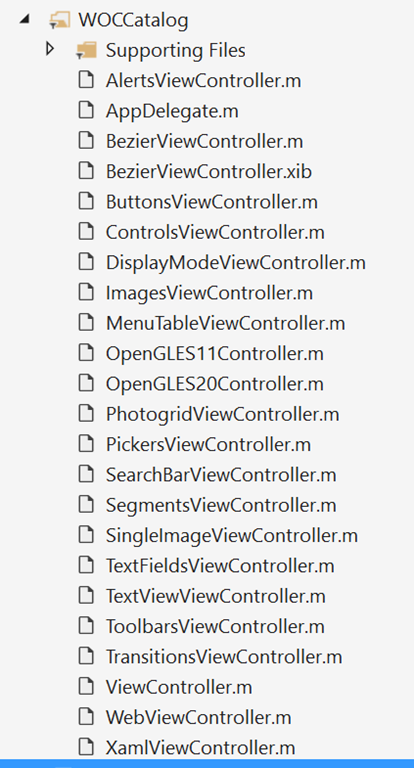 and it would seem that in iOS all views are backed by layers and views are a ‘thin wrappers around layer objects’ whereas it seems that’s not the case in OS X. 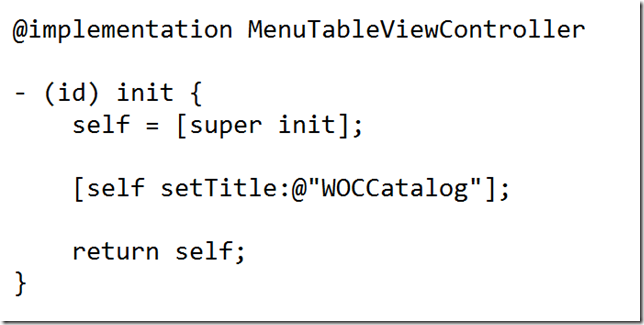 It also seems that a layer’s contents can be provided by giving it an object, providing it with a callback or subclassing it and doing an ‘owner draw’ style approach. 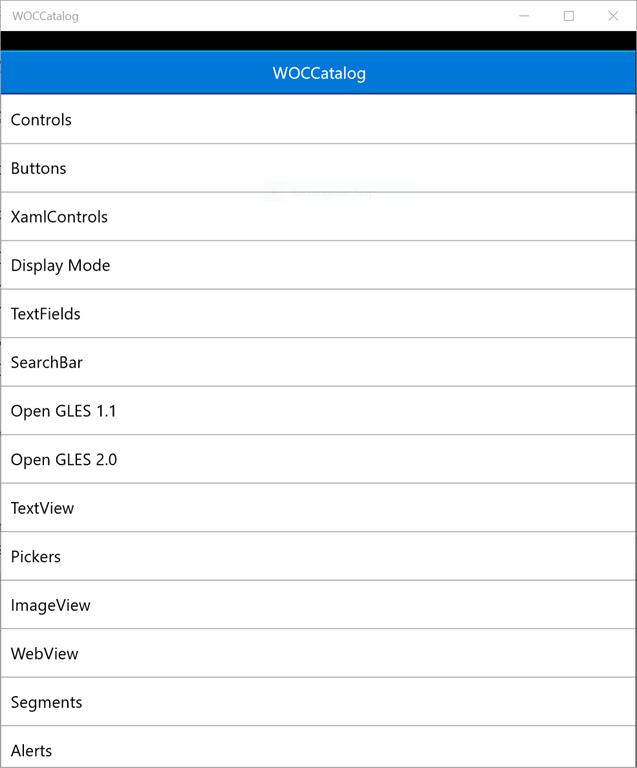 and I thought that I had all of those so I tried to press ahead and opened up the project named WOCCatalog for Windows 10 that lives in the samples folder (this is all as directed on the website). 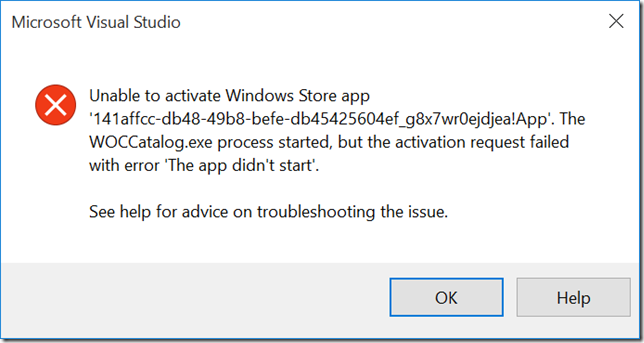 and then I tried to run it on a Windows 10 Mobile device where I got blocked around errors relating to something called “XamlCompositorCS” which seemed to be a missing reference. 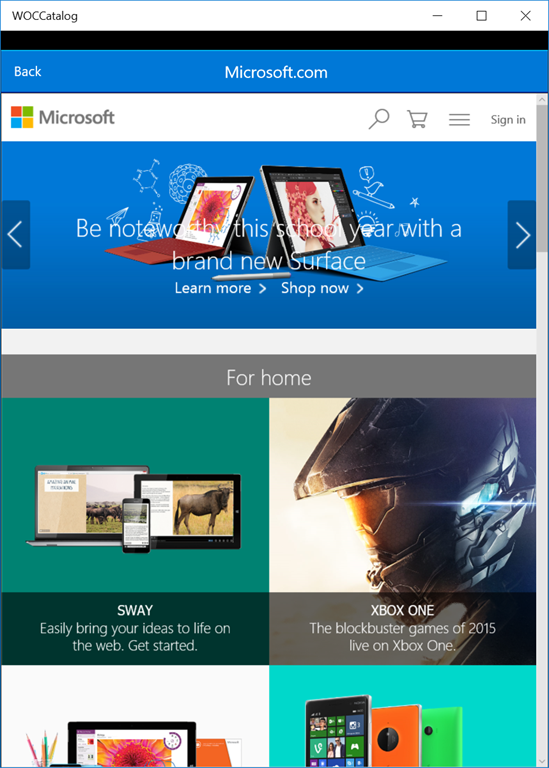 and if I try and launch it from the start screen on the Phone then it seems to just exit. However, this might be a temporary gremlin or it might be that my emulators are now a little out of date as I haven’t updated them for a while. which seems to be bootstrapping the whole process. I figured that I might learn more by trying to debug the code rather than trying to read through it and so I launched the debugger. 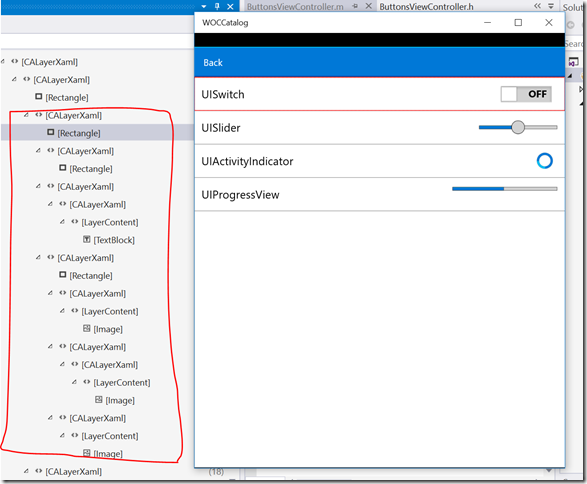 and using dumpbin /exports on that library didn’t find me a UIButton export as such but it did show me a _OBJC_CLASS_UIButton and so I guess I’m prepared to believe that the implementation of UIButton and other UI* APIs are coming from that DLL. But, how does that UIButton work and what’s doing the drawing? 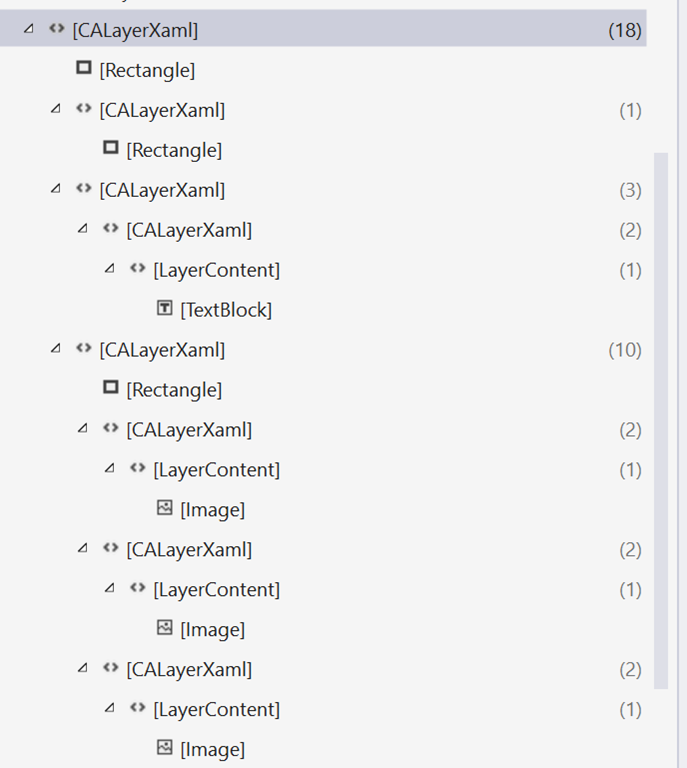 My next thought was to point the Live Visual Tree Explorer at it from Visual Studio and see how much of it was/wasn’t XAML and whether that helped me figure things out a little more. and so it’s a nested tree of CALayerXaml panels containing primitive Rectangle, TextBlock, Image controls rather than (e.g.) 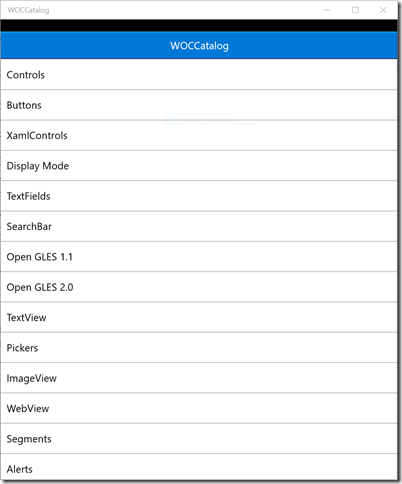 some re-templated version of a XAML ToggleButton which might have been my first thought as to how this might have been implemented. 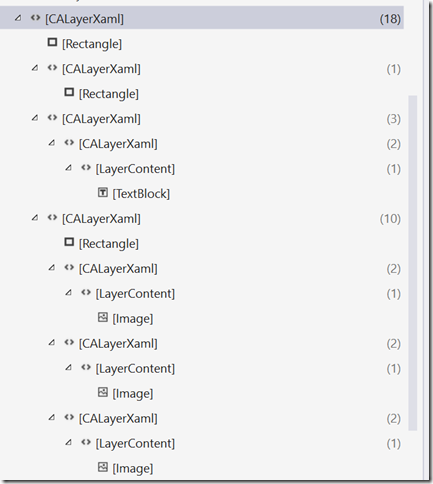 There’s an implementation of CALayer (CALayerXaml) which is wired in to display any XAML element. 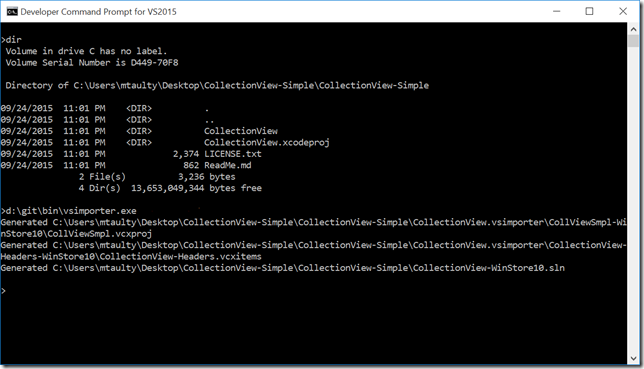 UIView sits on top of CALayer. UIImageView sits on top of UIView by using an XAML image element to display the image. 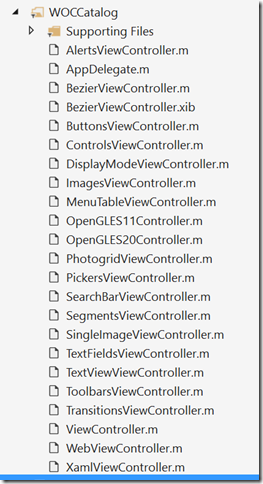 This allows for a control like a UISlider to implement itself in terms of 3 or 4 UIImageView sub controls. 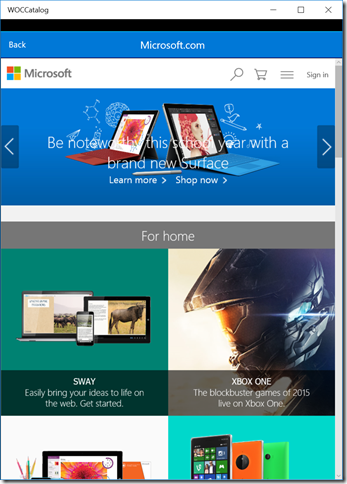 which all seems to fit together but it still left me wondering how all this got bootstrapped and plugged together. 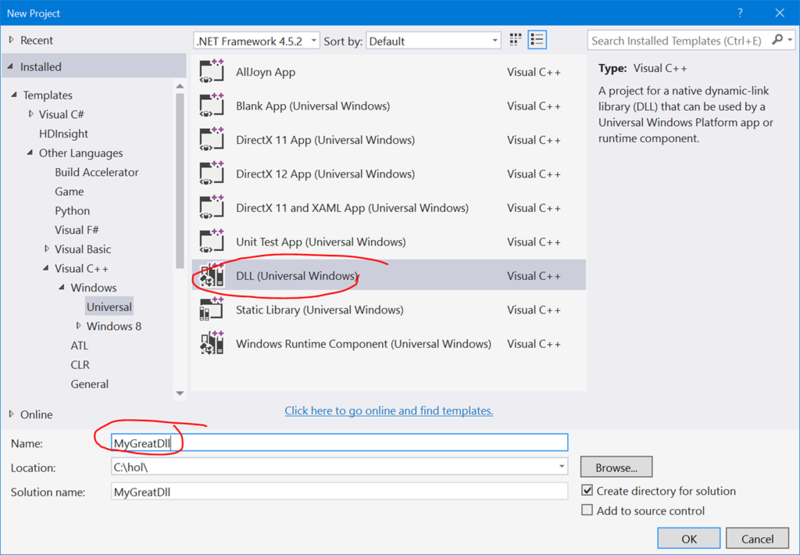 Given that the project is open-sourced, it felt like it was time to have a look at the source code to try and figure more about what’s going on and so my next step was to clone the repository from Git and build the SDK locally using the provided solution file which took just a few minutes on a Surface Pro 3 to make a debug build and which completed without any errors from the 17 projects within. I then opened up the same sample project that I’d already been trying out but this time I opened it up and built it within the folder structure of the cloned Git repository, hoping that it would pick up the debug libraries that I’d just built so that I might better try and debug them. That worked out fine and so I could single step my way through the sample, watching it start-up and so on. Debugging this application is fascinating to me as someone who knows nothing about Objective-C or iOS apps – there’s an unusual combination of familiar/foreign in that I can kind of figure what’s going on conceptually but I can feel my ‘conscious incompetence’ around a lot of the details. I started from ‘Main’ and tried to debug ‘forwards’ to see how the application spins up. This function calls straight into Objective-C code in main.m which has its own main which creates a UIApplicationMain and passes to it the AppDelegate class along with argv and argc. and so, at one level that feels kind of ‘familiar’ and not too alien at all perhaps apart from the calls to IWSetXamlRoot (Islandwood?) and IWRunApplicationMain. 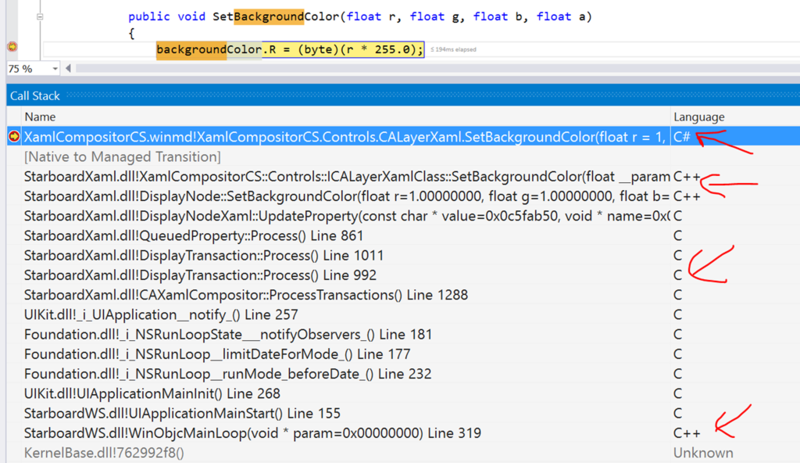 this implements a CACompositorInterface defined in CACompositorInterface.h and seems to be the abstraction that separates the code in CALayer.mm from the details of composition. The interface deals in terms of DisplayNode, DisplayAnimation and DisplayTransaction and the actual implementation subclasses DisplayNode to make a DisplayNodeXaml. the compositor is ‘registered’ with the CALayer.mm module via a global function that puts the instance behind global/static Get/Set methods. 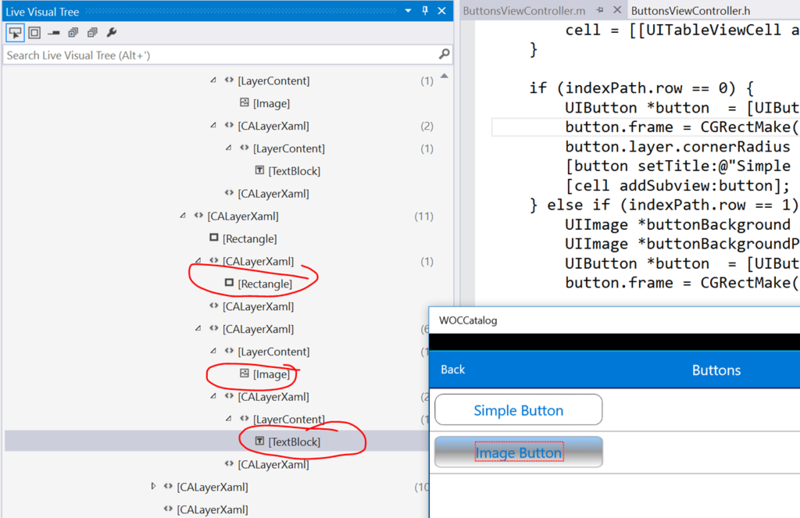 does some work to register an input handler XamlUIEventHandler (for pointer up/down/moved and key down) into a C# module (CALayerXaml.cs) that provides the CALayerXaml implementation derived from Panel and exported out of this as a WinRT component. 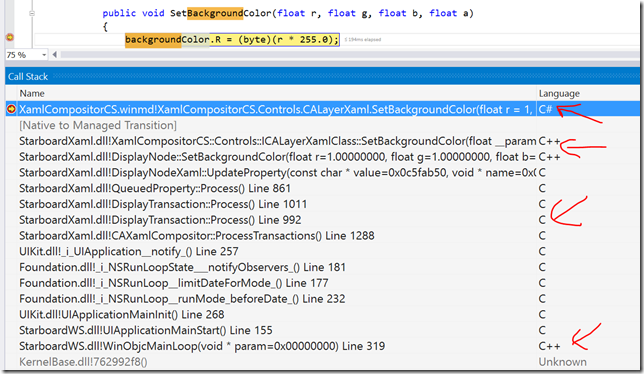 the CALayerXaml handles input by delegating the calls down to this XamlUIEventHandler before marking those events as having been handled. CALayer seems to draw through the CACompositorInterface (and core graphics) implementation that it is given which, in this case, is the CAXamlCompositor and associated DisplayNode, DisplayTransaction, DisplayAnimation types. and that ends up calling through to UIApplication viewChanged which seems to call into NSRunLoop on either a main or current loop. 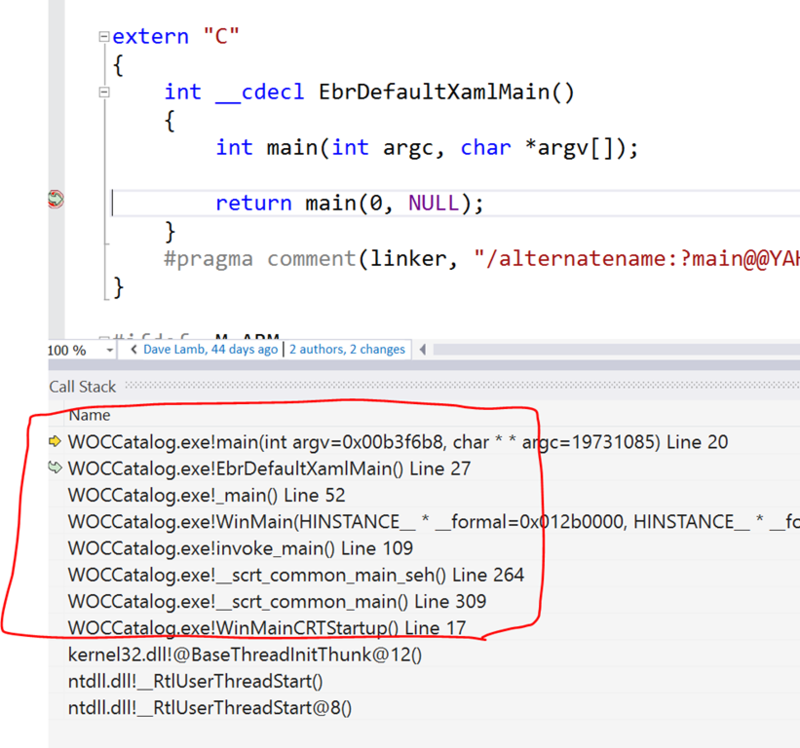 and that’s an interesting thing in terms of the C++/C#/Objective-C call stack. which I haven’t fully dug into at this point. WinObjcMainLoop which sets up some kind of Windows event to wait upon before calling into UIApplicationMainStart which is a more meaty looking piece of work in StarboardWS.mm which seems to set up the default orientation, some widths, heights and scales, a tablet setting before calling UIApplicationMainInit and UIApplicationMainLoop. 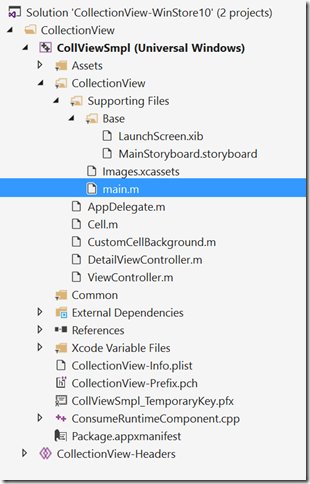 UIApplicationMainInit (UIApplicationMain.mm) seems to call back into where I was in Experiment 1 in that this method calls back into AppDelegate.didFinishLaunchingWithOptions. 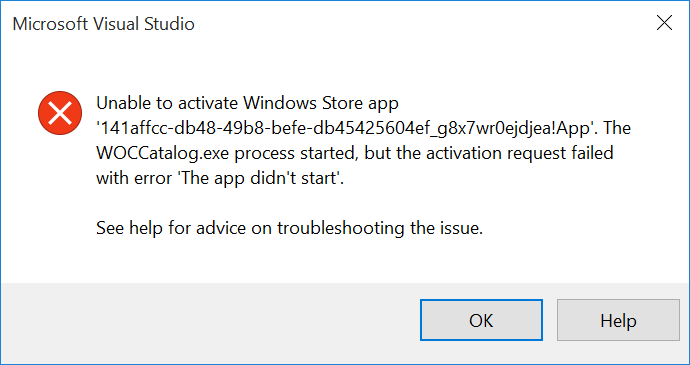 and then activating the application via AppDelegate.applicationDidBecomeActive (which the sample doesn’t do anything specific to handle) and setting its windows to be visible. The UIApplicationMainLoop then uses NSRunLoop to run the main loop of the application. I wanted to step back from trying to figure out the code and get more of a feel for what it’s like to import an XCode project here because the project that I’ve played with so far had been imported for me. I had a look at the wiki around how this process works and then I thought I’d try an Apple sample to see if I could apply the process to a standard sample. I went over to Apple’s sample code and I thought that I’d try out a UIKit sample like this CollectionView-Simple sample and so I downloaded that. I picked that one out partially at random but also because it said it was a UIKit sample and I’m not sure how samples that targeted other areas like NetworkExtension or CoreMotion would or would not work as I don’t think those APIs are currently part of the preview so I suspect there’d be a lot of work to do there to try and get those samples to build. and that left me puzzling a bit over why a Cell which is a UICollectionViewCell didn’t seem to have a selectedBackgroundView property. I looked at the reference here and, sure enough, it looks like there should be a selectedBackgroundView property from iOS 6.0 onwards. 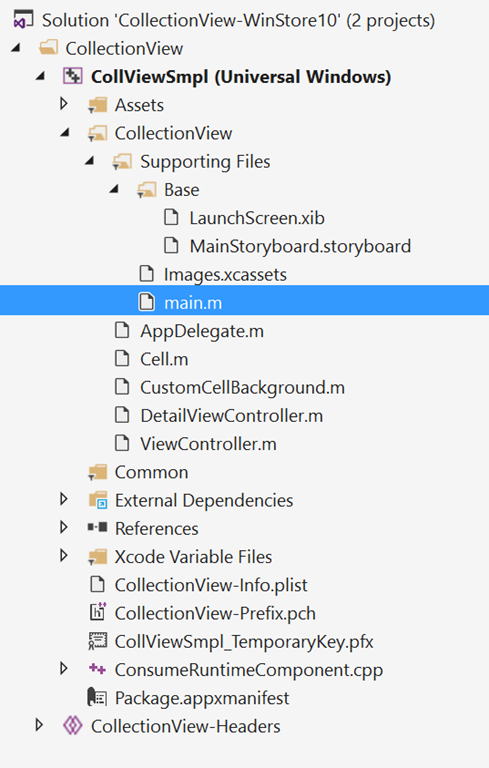 Looking into the source code for the bridge, in UIKit/UICollectionViewCell.mm I could find some references to a selectedBackgroundView but it didn’t seem to be a public property. 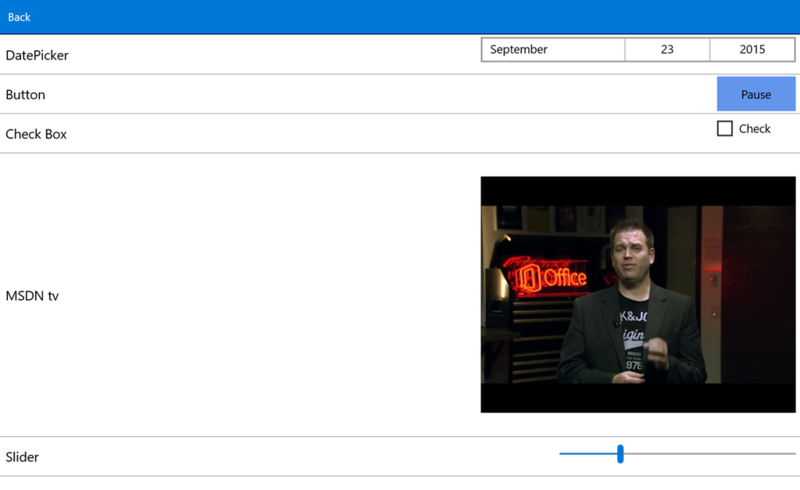 I hadn’t realised that this sample contained storyboards and the wiki says that Storyboards are not yet supported. Now, with a detailed knowledge of what Storyboards in an iOS application actually involve, I might be able to work around this but, for the moment, I was blocked on importing that project and getting it to build. I’m going to take a look at a few more of the Apple samples to see if I can get those to import here but, meantime, I thought I’d share these notes in case they’re of use to other folks (including, of course, anyone who wants to correct some of the mistakes I’ve probably made along the way here! ).